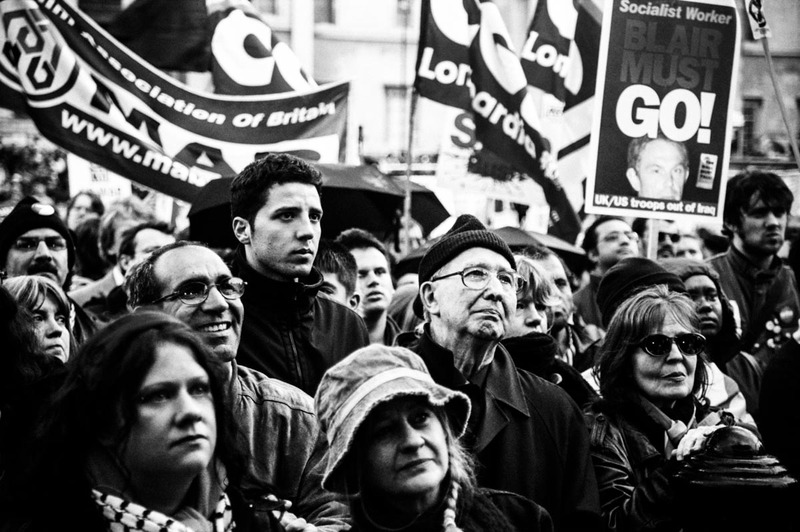 Despite the pouring rain, the 2002 May Day demonstration in London had remained upbeat and reached Oxford Circus earlier than expected. 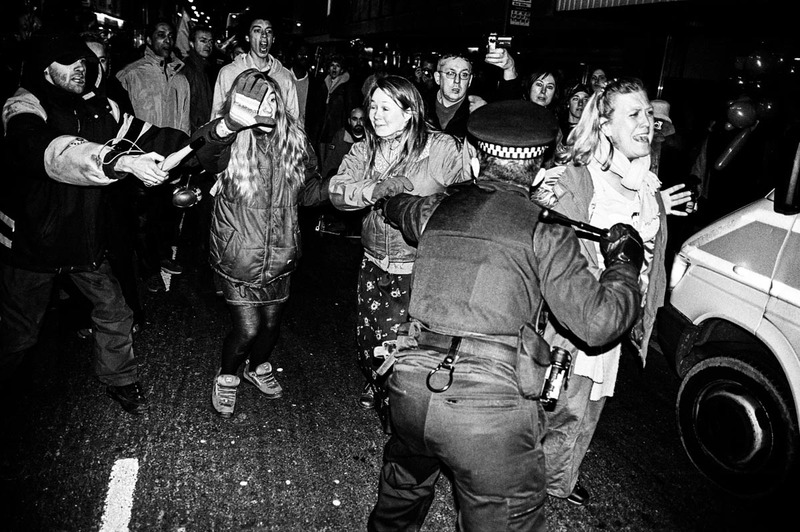 However, as more people arrived, the police moved in behind the protesters, and refused to let anyone out. 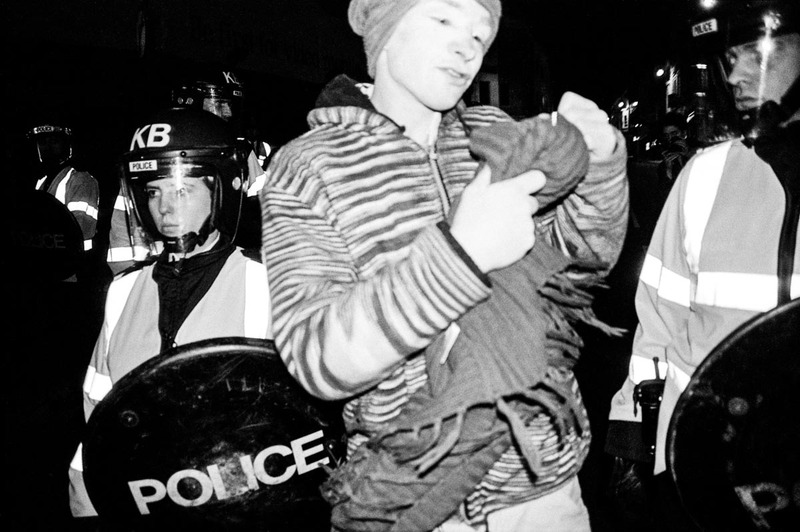 This led to violent confrontations between police and protestors and attacks on shops including Nike Town and H&M. 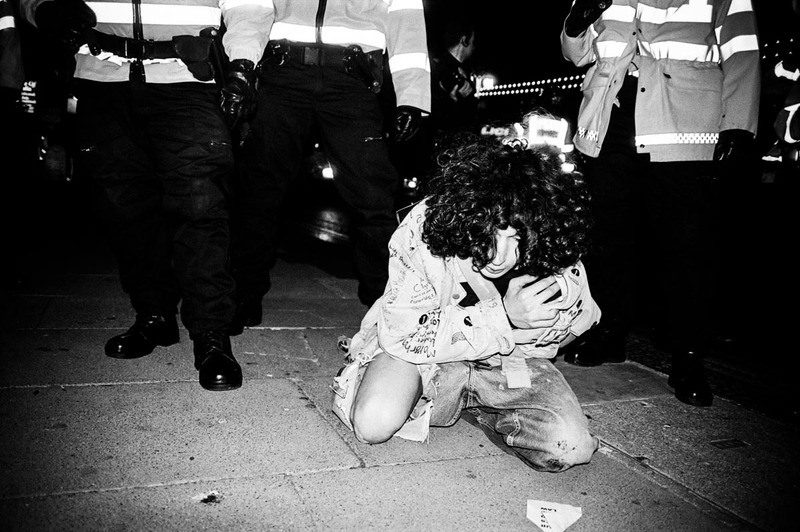 Such was the scale of the disruption in the capital that all the major British newspapers featured images of the protest on their covers the following day. Image copyright © Thaddeus Pope 2002. 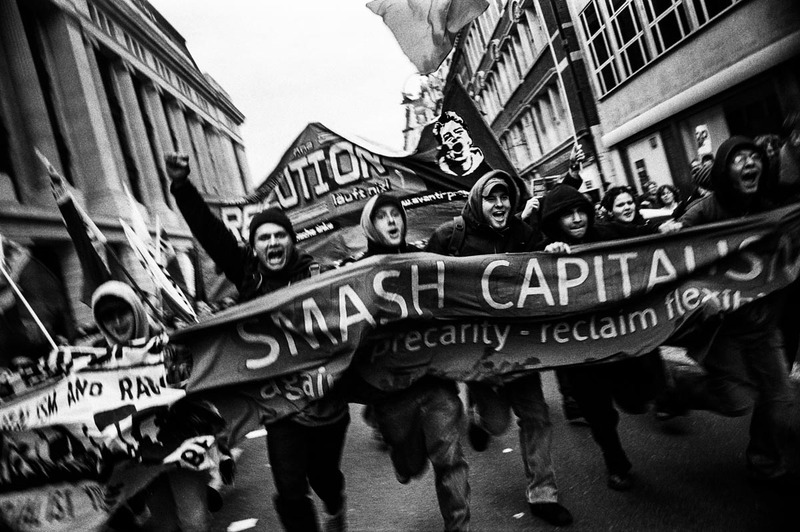 “Smash Capitalism”, London, England, October 2004. 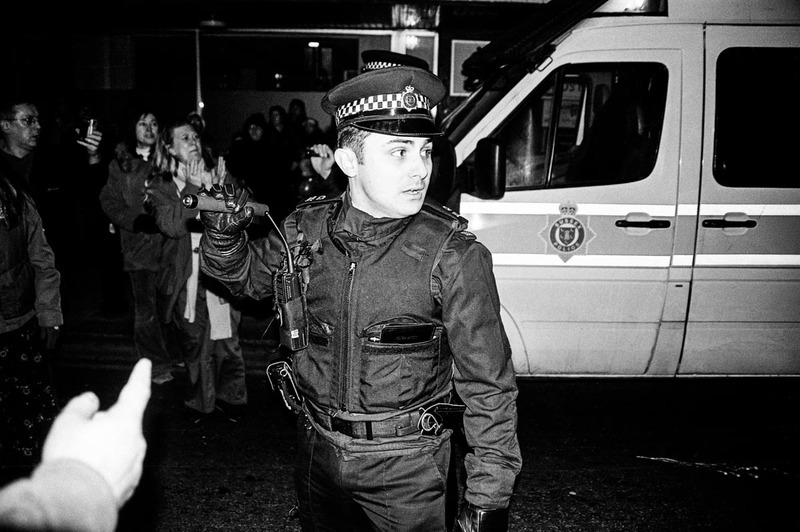 Following a day of seminars, workshops and cultural events at The Third European Social Forum – an event which focused on addressing major European and global issues, with particular attention paid to coordinating efforts against the ongoing occupation of Iraq – tens of thousands of antiwar and anti-capitalist protestors held an impassioned demonstration in central London. Image copyright © Thaddeus Pope 2004. 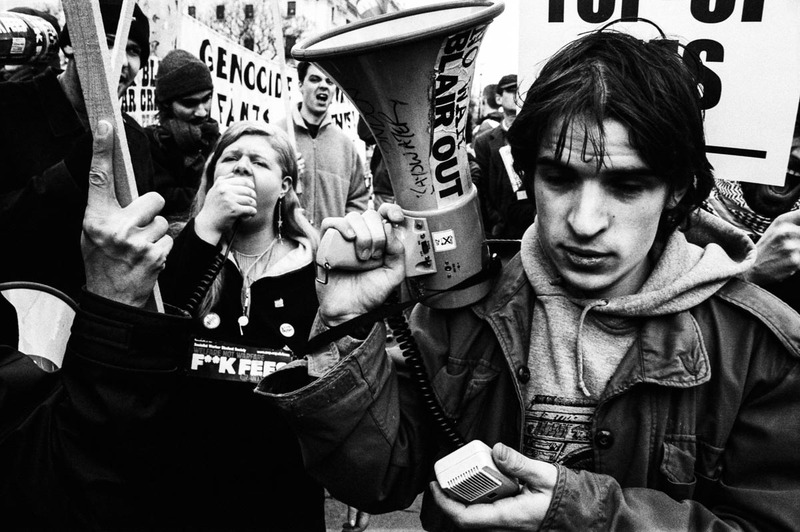 The European Social Forum was a recurring international conference established to allow “social movements, trade unions, NGOs, refugees, peace and anti-imperial groups, anti-racist movements, environmental movements, networks of the excluded and community campaigns from Europe and the world to come together and discuss themes linked to major European and global issues, in order to coordinate campaigns, share ideas and refine organising strategies” (Wikipedia). 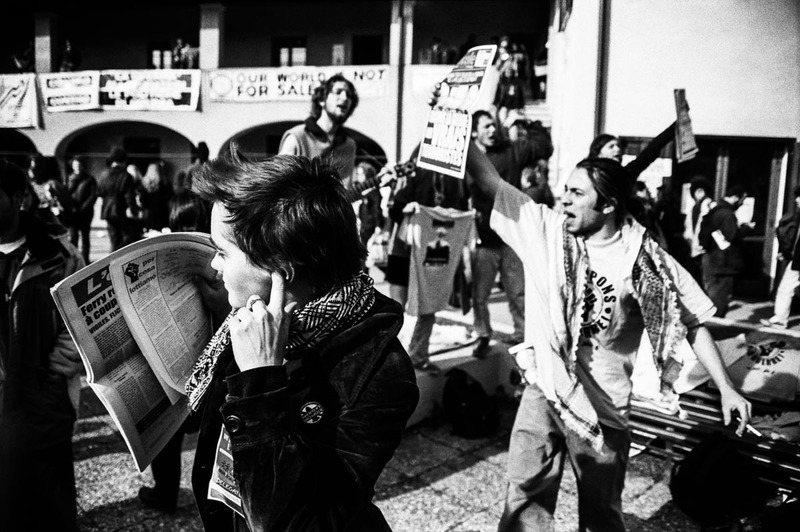 Held in the historic Renaissance city of Florence, Italy, the slogan of the first European Social Forum was "Against war, racism and neo-liberalism” – a specific reference to US president George W. Bush's plan for regime change in Iraq. The forum ended with a huge demonstration against the potential war in Iraq, which some sources estimate was attended by 1,000,000 people. Image copyright © Thaddeus Pope 2002. “Blair Must Go!” Trafalgar Square, London, 2003. Image copyright © Thaddeus Pope 2003. 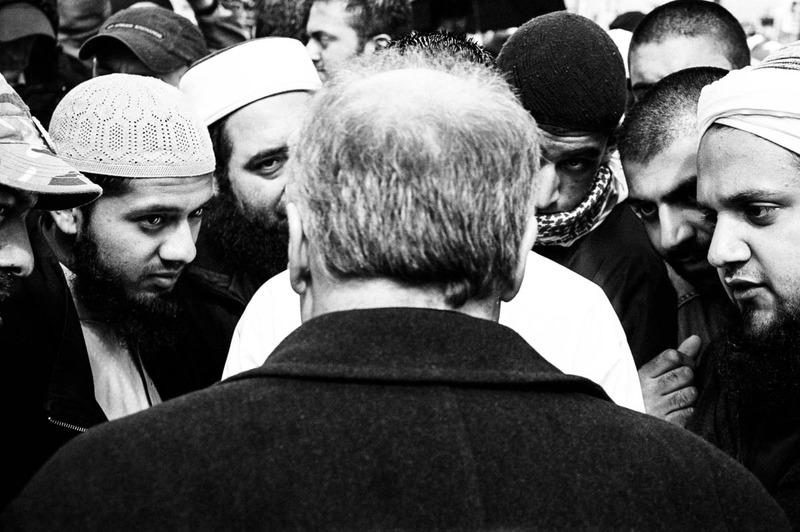 George Galloway, the then Member of Parliament (MP) for Bradford West, discusses the ongoing conflict in Iraq with a group of anti-war demonstrators in Trafalgar Square, London, UK. Image copyright © Thaddeus Pope, 2004. 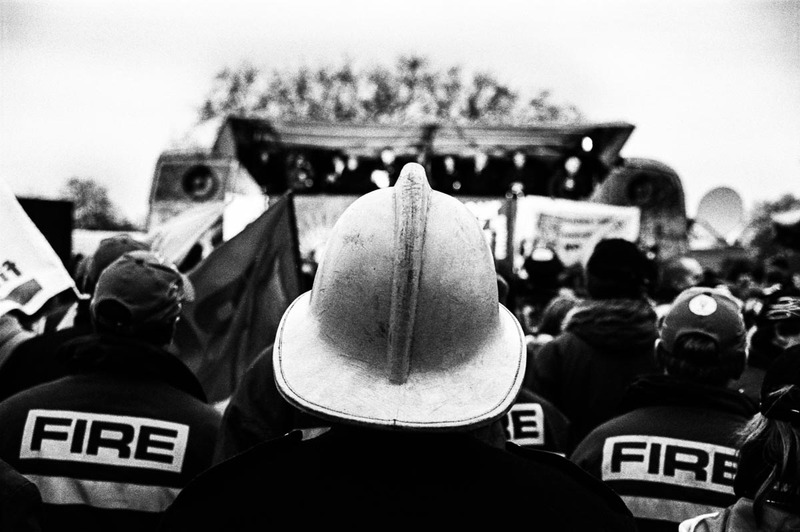 “FAIR PAY IS 30K” Fire Brigades Union (FBU) demonstration, Hyde Park, London, 2002. 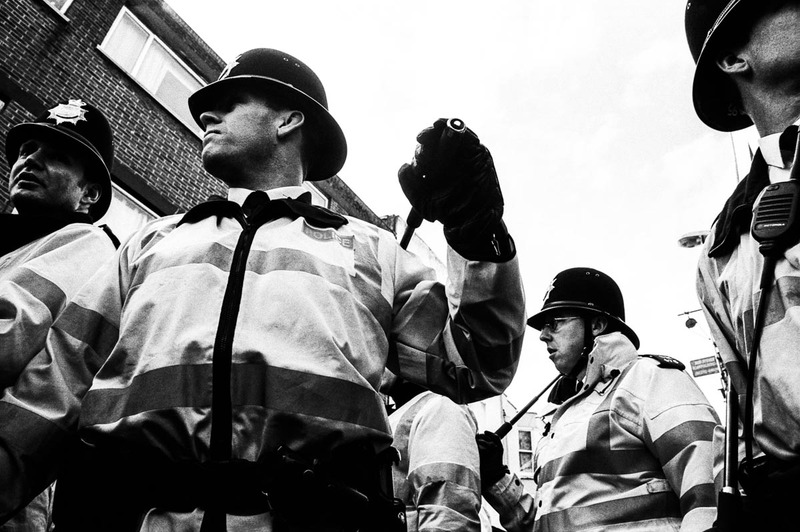 In December 2002, 20,000 firefighters and trade unionists from around the UK marched through the centre of London demanding fairer pay for British firefighters. As night fell over the city and the demonstration drew to a close, the crowd heard Fire Brigades Union General Secretary Andy Gilchrist “douse hopes of a swift end to the dispute with a combative speech warning that the union would pull out of mediation talks at the first sign of Government intervention” (The Guardian). Image copyright © Thaddeus Pope 2002. Following a massive demonstration in central London, which saw 20,000 firefighters and trade unionists from around the UK march through the streets of the capital demanding fairer pay for British firefighters, Fire Brigades Union (FBU) General Secretary, Andy Gilchrist, speaks to a news television crew in Hyde Park about the events of the day. 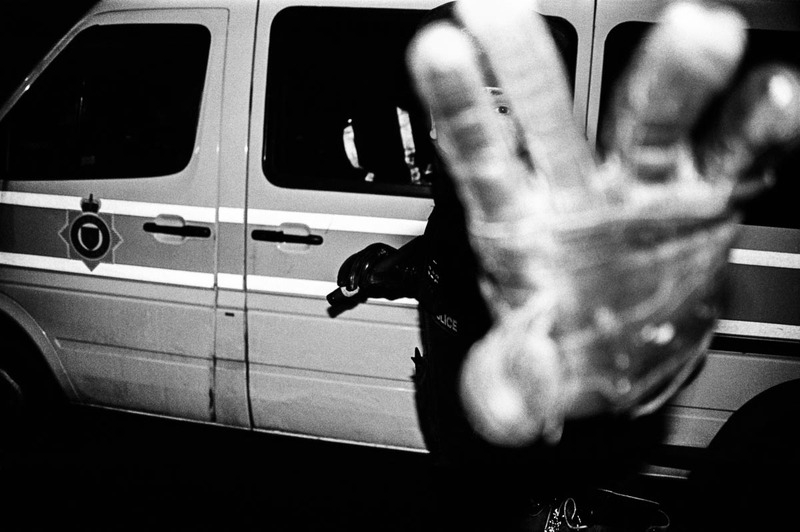 Image copyright © Thaddeus Pope, 2002. 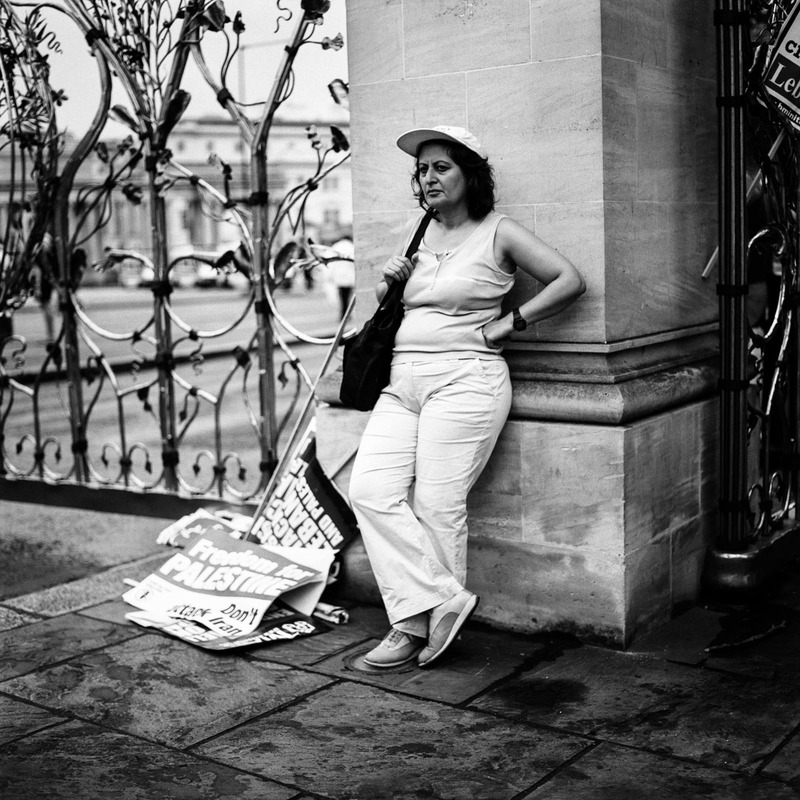 Following a day of action in central London which called on the UK government to help de-escalate the violent 33-day conflict between Lebanon and Israel known as the 2006 Lebanon War, an anti-war demonstrator rests against Hyde Park Gate next to a pile of discarded placards. Image copyright © Thaddeus Pope, 2006. Opposite the 2004 Labour Party Conference in Brighton, members of the Pensions Action Group attempted to draw attention to their plight by marching along the seafront and performing a "Full Monty" striptease on the beach under the groups slogan “Stripped of our Pensions”. "The group is protesting about the insufficient amount proposed by the government to resolve our pension robbery. We are not asking for assistance - we want the restoration of our pensions that we have paid for," said a spokesman (The Guardian). Image copyright © Thaddeus Pope 2003. 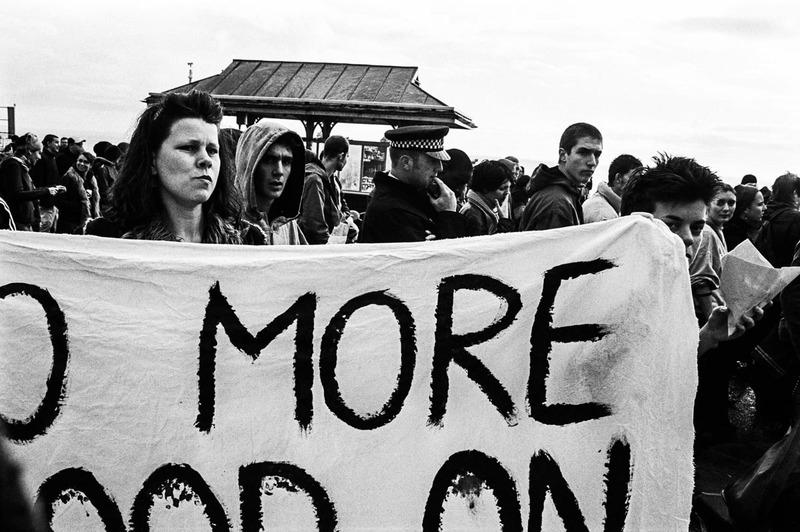 Students gather in Parliament Square to protest against the introduction of top-up fees in the UK, London, 2004. In January 2004 – an hour or so after this photograph was taken – Tony Blair’s Labour government won its vote to introduce student top-up fees, thereby allowing British universities, by law, to set their own level of tuition fees, rather than adhering to the rate previously set by the government. Though the introduction of student top-up fees faced widespread opposition, with many arguing it would create a two-tiered education system in the UK, the government was able to narrowly win the decision with 316 voting for the bill and 311 against. The rate set by the government at that time was £1,050 a year for undergraduates. Ten years later, the average annual cost of tuition fees in the UK is now £9,188, which makes university tuition fees in England among the highest in the world. 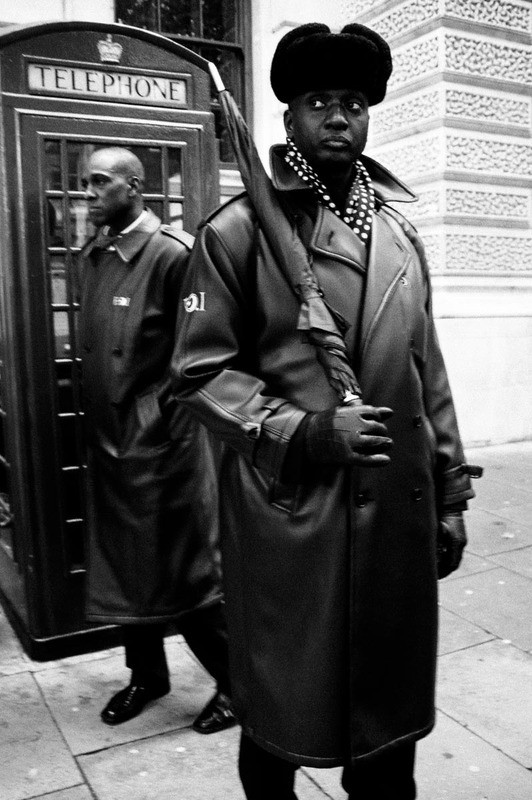 Two members of the Nation of Islam (NOI) stand next to a British red telephone box during the “Million Man March” between Parliament Square and Trafalgar Square in central London. Image copyright © Thaddeus Pope, 2006. 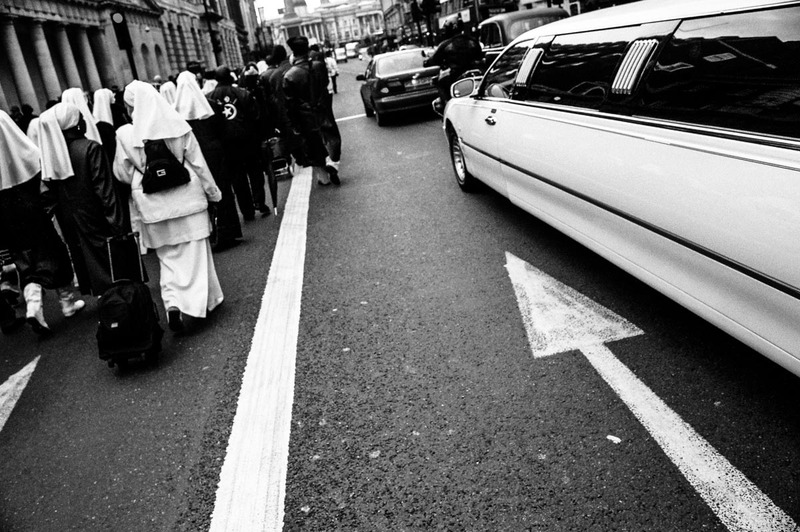 In a demonstration of solidarity between the two groups, Christian nuns and members of the Nation of Islam (NOI) march together down Whitehall during the 2004 Million Man March between Parliament Square and Trafalgar Square in London. Image copyright © Thaddeus Pope, 2004. 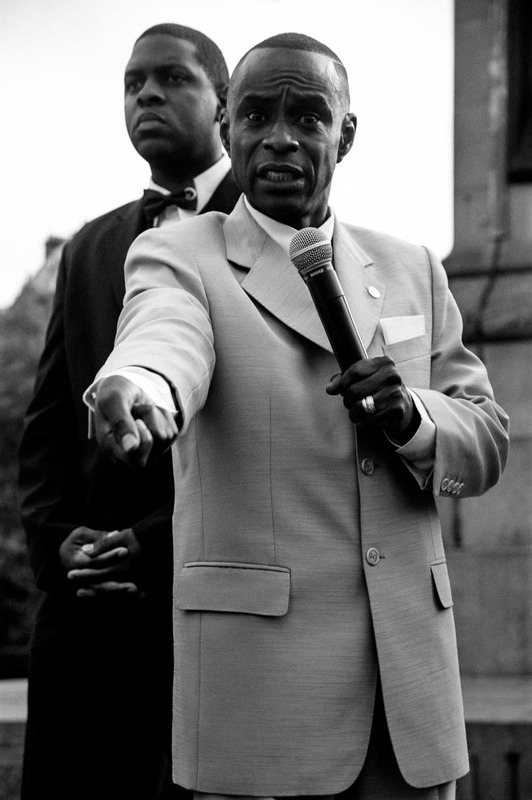 Standing on a platform in Trafalgar Square against the backdrop of Nelson's Column, minsters from the Nation of Islam address a large crowd of their followers during the Million Man March, London, England, 2004. Image copyright © Thaddeus Pope 2004. 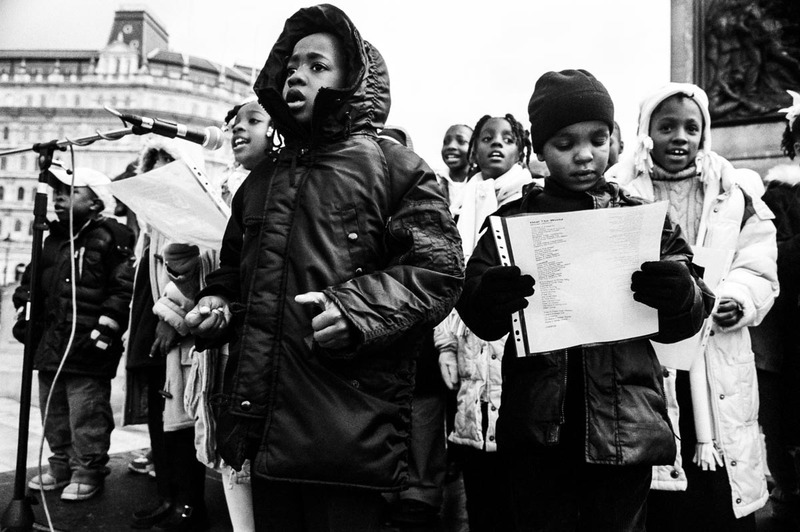 At the end of the 2004 Million Man March in London, against the backdrop of Nelson's Column in Trafalgar Square, children from the Nation of Islam sing “Heal the World” by Michael Jackson, London, England, 2004. Image copyright © Thaddeus Pope 2004. The Iraq War, which began with the invasion of Iraq by a US-led coalition in 2003, was a war for power, profit and control of the region and its resources. It also served as a clear and deliberate message to the rest of the world that the United States and United Kingdom were prepared to take unilateral military action without the support of international law or public opinion. 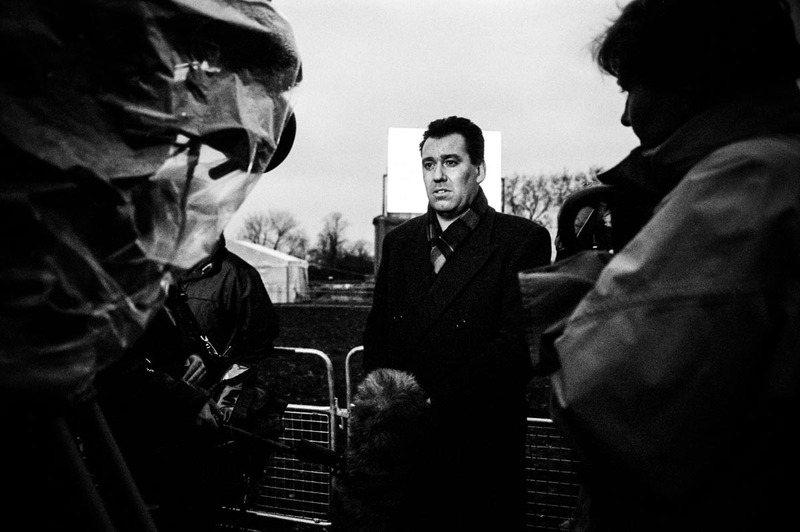 Even by those who supported it at the time, including former Deputy Prime Minister Lord John Prescott, the decision to take part in the invasion of Iraq is now widely regarded to have been illegal and a mistake 1 – a mistake that, according to the long-awaited Iraq Inquiry (also referred to as the Chilcot Inquiry), was made on the basis of “flawed” intelligence and that failed to adequately plan and make preparations for Iraq after Saddam Hussein’s deposition. There is no doubt that Saddam was a merciless, repressive, loathsome despot – a despot the United States and United Kingdom had previously armed while he murdered Kurds and Shiites 2 – but the decision to take military action against Iraq “before the peaceful options for disarmament had been exhausted” was an egregious and unforgivable error on the part of the decision makers in Washington and London that has profoundly exacerbated the level of violence, suffering and instability in the region and only increased the threat of stateless terrorism around the world. The birth of so-called Islamic State is one of the grotesque and catastrophic consequences of the invasion of Iraq in 2003 and other US-led military interventions over the last quarter of a century in the Middle East. In 2015, Tony Blair himself even acknowledged that without the Iraq war there would be no ISIS 3. Like most people, I believed Iraq, the Middle East and, indeed, the whole world would have been better off without Saddam Hussein. However, I felt that a policy of diplomatic pressure, deterrence, no-fly zones, sanctions and containment was far preferable to an illegal war 4 to remove him from power – a war which, as of January 2017, is estimated to have led to the deaths of several hundred thousand Iraqis, most of whom were civilians, and cost trillions of dollars, not to mention the lives of the thousands of coalition servicemen and women who died in combat, the ongoing cost of veterans’ care and the financial burden that refugees fleeing Iraq have placed on other nations. 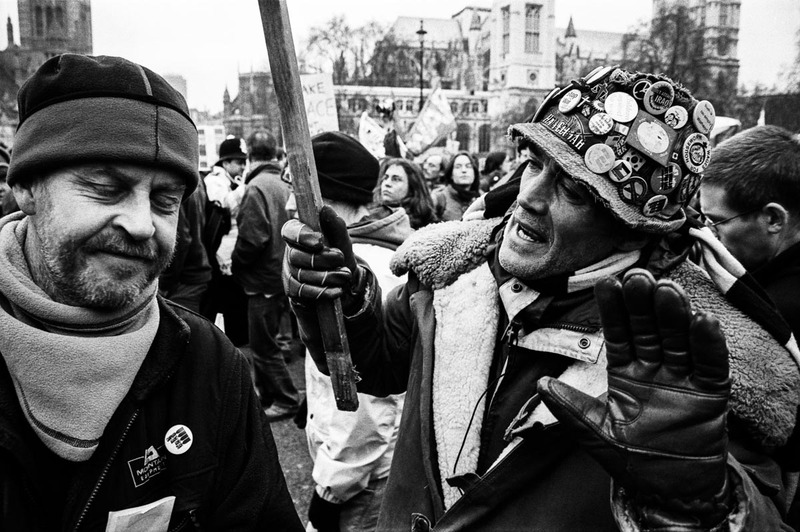 In the run-up to the invasion of Iraq, I felt that I had to do something to assist the anti-war movement, so I began organising local protests and travelled to London as often as I could to attend national protests. Like many others, I felt with almost absolute certainty that the strength and diversity of the anti-war movement and the numerous reasoned arguments against using military force would make it all but impossible for the British government to act without the support of the United Nations or a second resolution. 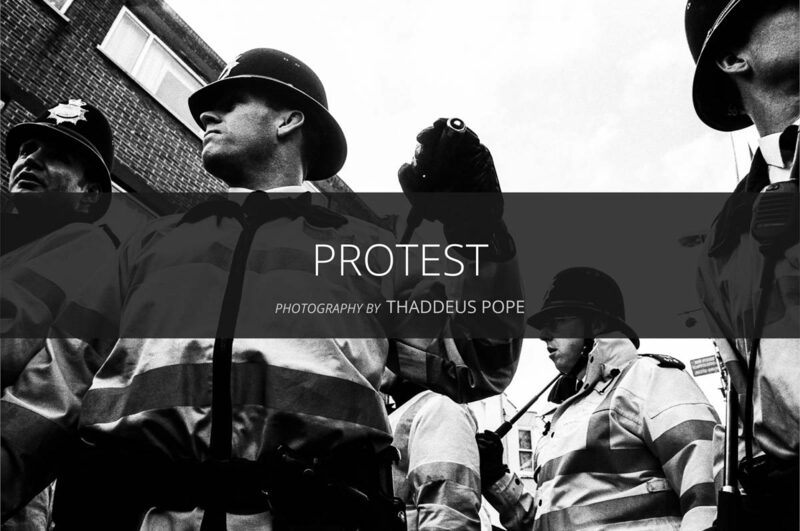 This felt especially true after a million people – although many believe the number was nearer two million – marched through the streets of London on February 15th, 2003 in the biggest protest in British history 5. 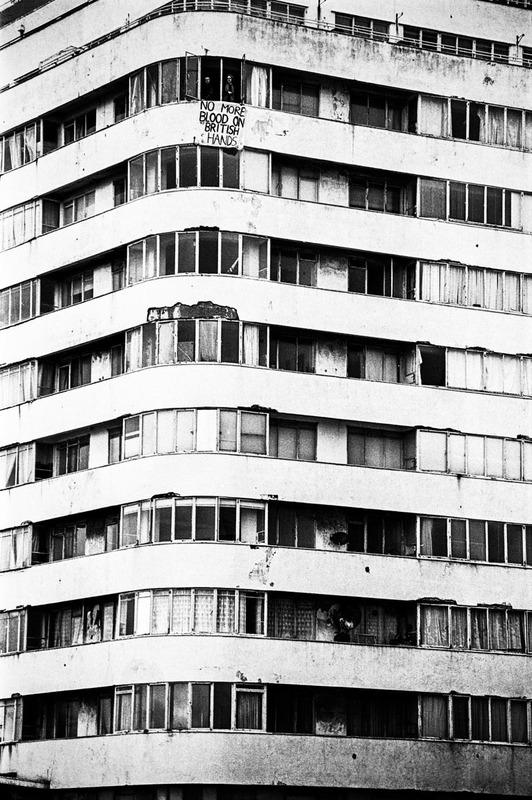 Sadly, however, despite the large-scale public expression of disapproval and disgust, the case against the invasion was dismissed and the country was taken to war under the leadership of Tony Blair and his cabinet. 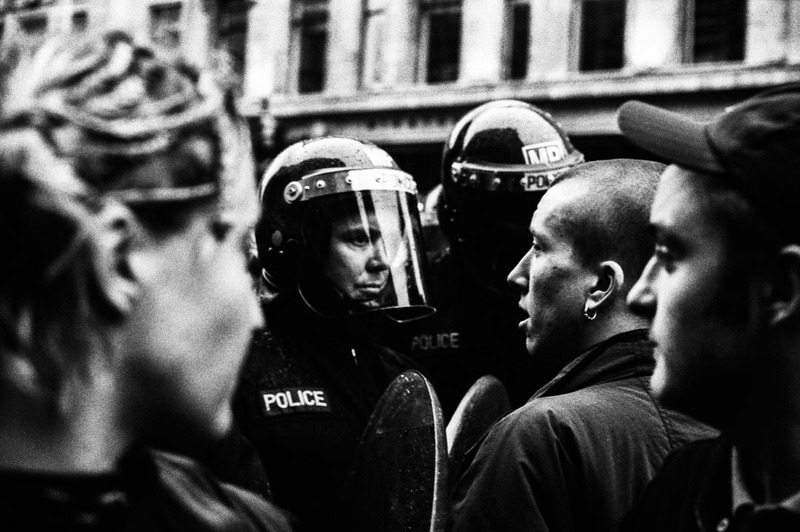 For me, the protests that took place in the months and years following the invasion of Iraq seemed like futile expressions of anger and disappointment, and served more as a chance to meet and share frustrations with other people who felt as disenfranchised and disillusioned with the political system as I did than meaningful ways to influence government policy and decision-making. The photographs in this portfolio were made between 2002 and 2007 and reflect some of the highs and lows of that period, as well as documenting my experiences. 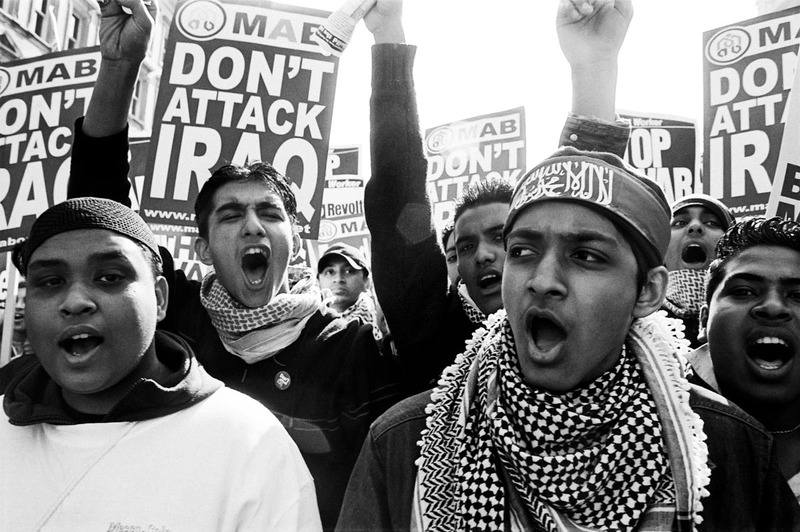 The protests in 2003 did not stop the invasion of Iraq, or seem to effect any real change at the time, but that period of discontent with the political establishment led to a huge shift in public opinion away from war and radicalised and politicised an entire generation. It also led to a change in the political system to prevent the British prime minister from taking the country to war without the support of the House of Commons. That legal requirement offers some protection against future military adventurism, and is a direct consequence of those protests. Update: In addition to images of demonstrations against the war in Iraq, I’ve also added a number images I made during the same period at demonstrations against the 2006 Lebanon War, the introduction of student “top-up” fees, the Fire Brigades Union protests of 2002-2003, Pensions Action Group protests, and the Nation of Islam’s Million Man March in London.